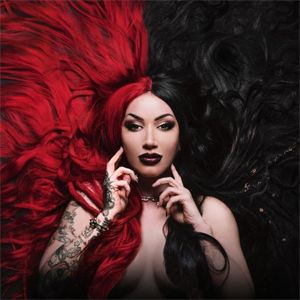 Billboard charting rockers NEW YEARS DAY release their new track "Come For Me" today. Check out the official lyric video for the track, which was added to Spotify's New Music Friday playlist, below. This is the third release off of the band's new album Unbreakable, out on April 26 via RED MUSIC. ""Come For Me" is my fight song. It's my call to rally everyone who wants to get together and stand against anyone and everyone who's got something to say to us," states singer Ash Costello. "We live our lives online so much now. That invited anyone who's got a negative opinion into our worlds. I got to a point where I just felt that I wanted to turn it into a fun time, a fun song. It's the NYD version of "Hollaback Girl"... just A LOT heavier. It's also the first song we wrote for the album AND the first song that I got to have 100% say in exactly what I wanted, how I wanted it to sound, what I wanted the song to do and what I wanted to say. No more metaphors. If you don't like me then say it to my face and not behind a screen. I'll guest list you"
"Come For Me" follows the band's previous releases "Shut Up" and "Skeletons", which have both solidified NEW YEARS DAY's position as the band to watch in 2019. "Shut Up" is Active Rock radio's #2 greatest gainer on the chart, jumping from #44 to #26. "Shut Up" is currently featured on Spotify's "Rock Hard", "Heavy Queens", "New Metal Tracks", "New Noise", and "Fierce Femmes" playlists along with Apple Music's Breaking Hard Rock" playlist and Amazon Music's "Rock Scene", "Brand New Music", and "Fresh Hard Rock" playlists. The track has over 500,000 total streams. Topping it off, the band's debut track, "Skeletons", off of Unbreakable, has raked in over 3 million streams and counting. Unbreakable, NEW YEARS DAY's 4th studio album was produced by Mitchell Marlow (ALL THAT REMAINS, IN THIS MOMENT) and Scott Stevens (HALESTORM, SHINEDOWN, AMERICAN AUTHORS). Unbreakable is the follow up to the band's 2015 LP, Malevolence, which hit #45 on the Billboard 200, thanks to the radio hits "Defame Me" and "Kill Or Be Killed". NEW YEARS DAY will be hitting the road this month with FALLING IN REVERSE as support on the band's U.S. tour. The tour will kick off in Las Vegas on April 20th and will wrap on May 24th in Los Angeles.